By offering versatile track layout solutions and resident lifting capacity geared to tomorrow’s heavier resident population, Maxi Sky 600 offers the best possible coverage for your facility. • The ideal ceiling lift for routine transfers of non-ambulatory residents. With a lifting capacity of 600 lbs. 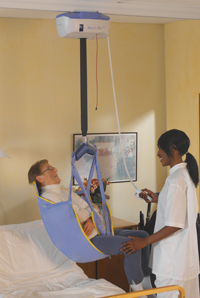 (272 kg), it is also designed to help you meet the demands of handling heavier care facility populations in the future. • The modular track system enables flexible solutions, so a track layout can always be optimized for your needs and the specific working space. • A complete range of loop or clip slings is available for use on the applicable 4-point or 2-point spreader bar. The Walking Jacket is also compatible. Maxi Sky 600 is simple to operate. Regulation of lifting speed and spreader bar height is programmable from the handset. Several features brake, lowering system and cord-pull stopping device safeguard the resident in the event of an emergency. A limiter prevents lift use if the battery is low. The unit is always ready for use. After transfers, the lift cassette is returned to the clip-on charging station, which can be positioned anywhere on the track. Immediate electronic soft-start and soft-stop means there are no delays or “overrun”, ensuring the lift can always be stopped exactly in the required position.